The first opinions that indicated that Ohtani would have more development as a pitcher than as a batter seem to be accurate. His speed has not yet reached the highs that have been measured previously but the Japanese have a good array of secondary pitches, willingness and many athletic skills, according to specialists. 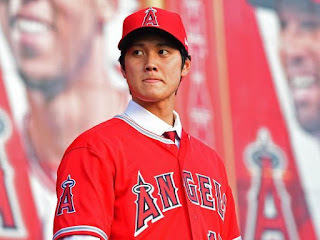 On February 14, Valentine's Day, Shohei Ohtani came to Tempe loaded with her unlimited talent, charisma and simplicity, as well as an ambitious agenda. He will be one of the members of a rotation of six pitchers with the Angels, and also is to serve as designated hitter when manager Mike Scioscia sees it fit. Ohtani seems destined to the same kind of scrutiny that Ichiro Suzuki, Hideki Matsui and Yu Darvish when they arrived in the United States, and the nature of his purpose of being a player in both sides of the game adds an unprecedented level of interest. "He's trying to throw and hit - that's unique in its own right," says Ian Kinsler, the Angels' second baseman who played with Darvish in Texas. "Apart from that, it's just a normal case of a Japanese superstar who comes to the United States to play baseball." From the moment that Ohtani unpacked his suitcase in the clubhouse, the process of adaptation has been full of small moments. He took his first round of batting practice in a backfield in the rain, causing the astonishment and exalted greetings of his teammates days later as he dispatched balls to the confines of Tempe Diablo Stadium. Ohtani the pitcher, however, has struggled over his fastball as he recorded four outs with 31 pitches in his Cactus League debut last Saturday against the Milwaukee Brewers. After the game, a Japanese television crew cornered American reporters, gave them large sheets of cardboard and a marker, asking them to evaluate his performance on a scale of 0 to 100. Oh, men, these are true fans! Ohtani singled and negotiated two base on ball in his debut as DH against San Diego two days later and then, against Colorado, he went 3-0. Ohtani is extremely discreet in his group sessions with the media, so Scioscia must deal with the heavy burden in his appearances, both with Japanese and American media, which go there every morning. On any given day, Scioscia can talk about Zack Cozart's transition from short field to third base or the flexibility of his new lineup, and then spend six to eight minutes talking about issues related to Ohtani. The showtime has just begun!